Something big is coming to the area. It’s a strong voice that’s full of soul and sass. Her name is Caroline Smith and she’s bringing her boisterous sound to both the Near Water Concert Series in Green Bay and the Mile of Music festival in Appleton. I recently interviewed Caroline Smith about her upcoming performances, which she says will have two slightly different arrangements. “One is with my full band and backup singers, and one is with just me and my upright bass player,” said Smith of her plans. The first concert is at the Meyer Theatre on July 30 as Smith and her band The Good Night Sleeps open for Thao & The Get Down Stay Down. The second is part of Cory Chisel’s first ever music fest on College Avenue. There, Smith will be playing a feature stage show on August 10 at Anduzzi’s Outdoor Garden. She’ll also play the following day at Houdini Plaza. 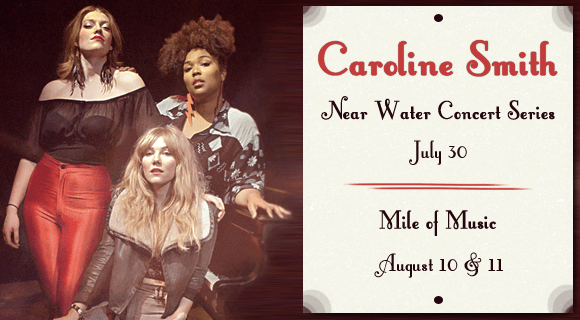 Click the links to purchase tickets for the Near Water Concert Series and the Mile of Music. Both events promise to showcase Smith’s evolving indie folk rock soul and R&B sound. Plus, if you attend one of the three concerts, you’ll get a sampling of Smith’s new record, which will be released this fall. I could sense the passion Smith had recording the new album when talking to her. With the addition of two backup singers, the now six-piece band has changed a lot since Smith’s early days playing coffee shops in her hometown of Detroit Lakes, Minnesota. Those beginnings and Smith’s evolution are captured beautifully in Dan Huiting’s documentary My Way Back Home: Caroline Smith. The film also shows Smith’s strong relationship with her mother and how that propelled her into a career in music. It’s that determination and work ethic that has landed Caroline Smith on some pretty famous stages, including the iconic First Avenue. Smith says she doesn’t mind the sacrifice of touring. It works out really well for her being with her best friends – her bandmates. Click the links to follow Caroline Smith and The Good Night Sleeps on Facebook and Twitter. As we wrapped up the interview I asked Smith about a tweet proclaiming her excitement for Kayne West’s recently released album Yeezus. “I think it’s perfect. I don’t think he could make a bad record. I don’t think he has it in him. I think it’s overly fantastic. It’s super dark and super heavy, he really molds contemporary music,” said Smith. Smith also expressed her displeasure with Kayne’s record being leaked before its release. While we all anxiously await Caroline Smith’s new album, let’s take a lesson from her book and become active listeners. As I said earlier, you can see Smith perform her new material at both Near Water and the Mile of Music. Don’t let either of these opportunities pass you by.